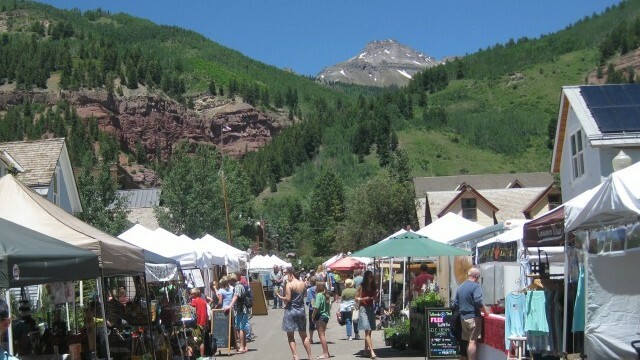 Every Friday (June-October) from 11am-4pm, Oak Street hosts a beautiful market of local crafts, produce, and any other goods you can imagine at the Telluride Farmer’s Market. The Telluride Farmers Market supports vendors with 100% organic products (75% minimum for most prepared foods). Products come from within a 100 mile radius of Telluride, assuring that what is sold is local, fresh, and has little environmental impact. Come out during the afternoon and you will find the street lined with a huge variety of vendors including local farms, gardens, bakeries, artists, and more. Looking for some specific fruits or veggies? Check out the produce calendar for an idea of when you might find you’re favorite crop in season. In addition to the endless vendor stands to peruse, there is free live music all day long at the base of the Telluride Gondola. See you at the Market!